This Champion Sports FitPro exercise ball chair is a comfy seat with many benefits for your body and mind. Traditional office and desk chairs are typically stiff and unforgiving, forcing you to slump and slouch to find a comfortable position. Aside from developing poor posture and back pain, this also causes you to feel more fatigued. By keeping you in an active sitting position, balance ball chairs strengthen your core, align your spine, and boost energy and productivity levels. 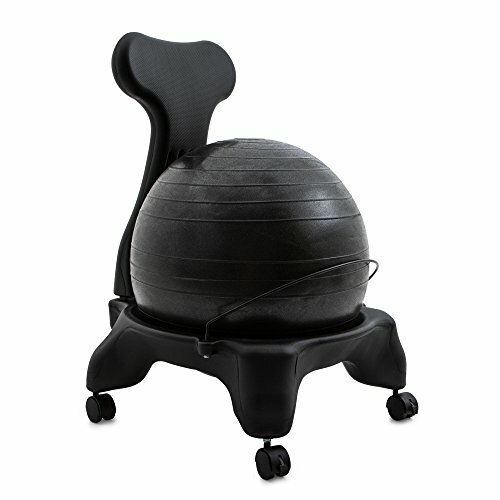 Exercise ball chairs promote a healthy, active lifestyle and are ideal for students, teachers, offices, gyms, physical therapy and more. The seat is a classic yoga ball that activates your oblique and abdominal muscles to strengthen your core without requiring any extraordinary movements. However, you can always incorporate some fitness exercises if you’re looking for a harder workout! A hand pump is included for fast, easy inflation. The 22 x 22 x 31 inch balance ball chair features a sturdy plastic frame with lockable wheels, allowing you to smoothly move around your workplace and safely secure the seat when needed. The base is very durable for daily use and quickly wipes clean. Lower back support is crucial for spine and back health when you’re seated in the same position for long periods of time. This Champion Sports exercise ball holder is designed with a sculpted back to provide ergonomic support and improve your spinal alignment, resulting in less stiffness and soreness. You can take this rolling ball chair wherever it needs to go. Between its wheeled base, lightweight components and compact design, it’s a breeze to push, pull and carry.